Salt cod (bacalao/bacalau/morue) is probably one of my favorite ingredients because it can be kept for a really long time (yay, preservation!) and when it’s prepared correctly and put into a dish, it is flavorful and light. Salt cod is a staple ingredient in the North Atlantic and Mediterranean, so you will see it on menus in places like Spain, Portugal, France, Greece, Norway, Russia, and even Africa. The number one thing you have to do in order to use salt cod is to desalinate it correctly. You can’t rush or skip this step – trust me – I made the mistake of rushing through the process once and we ended up having a bunch of inedible cod at a group dinner for six people. After the cod is prepared for cooking, there are dozens of dishes you can make with it – and today, we’re doing Brandade de Morue. If you didn’t already know, Anthony Bourdain is one of my favorite chefs – not because he’s some super innovative Michelin-starred phenom (he’s not, he’s more like a good chef with serious writing chops), but because he’s more of a no-BS kind of guy. I bought his Les Halles cookbook last year because I felt like it was a very straightforward guide to bistro classics, and I’d be able to learn the framework of some of Jules’ favorite childhood dishes. 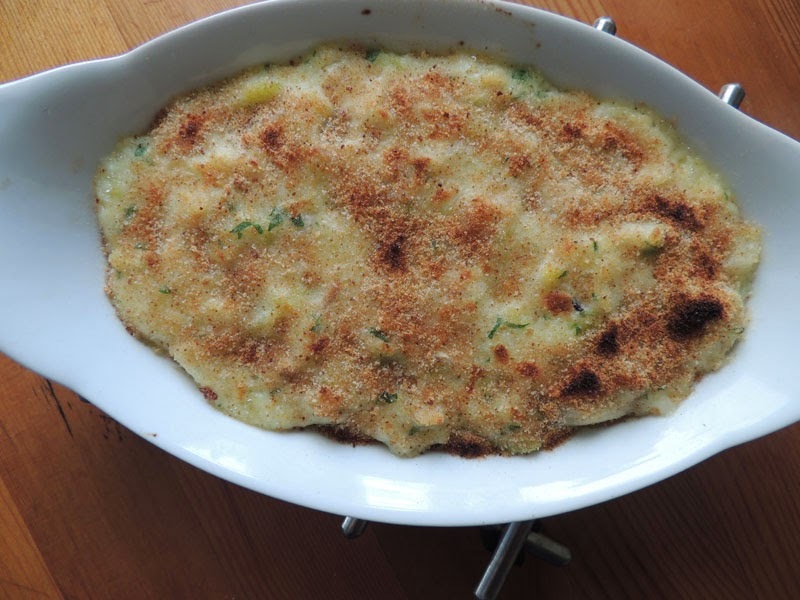 We went through the book together and marked off the ones that he wanted me to make (which ended up being almost all of them), and one that stood out was the Brandade de Morue, or, what you could call a “salt cod gratin“. You can serve this as an appetizer, or, just supplement it with a side of vegetables and it can be a main dish. It turned out to be a success – reminds me a bit of a really good seafood chowder – and now it’s one of my favorites too. Place the cod in a large mixing bowl and cover to the top with cold water. The cod should soak for at least 24 hours to rehydrate, and you should change the water several times; once every hour for the first few hours, and then every few hours after that. I repeat, do NOT rush or get lazy about this process! In a large pot, combine the cream, bouquet garni, and garlic, and bring to a boil. Once the mixture is boiling, add the fish and reduce to a simmer. Cook for about 6 minutes, then remove the fish wtih a slotted spoon and place in a clean mixing bowl. Bring the cream to a boil again and reduce slowly for about 10 minutes. Don’t worry if the cream doesn’t cover the fish – and do not add more liquid, or you will get the wrong consistency at the end. Remove from the heat, and discard the garlic and bouquet garni. Stir in the olive oil and set aside. Preheat the oven to broil. Use your finger to shred the cod very fine. Once it is thoroughly shredded, slowly introduce the cream and oil mixture, mixing well with a wooden spoon. After all the liquid has been added, adjust the seasoning and add the parsley. Transfer the mixture to the gratin dish and top with the bread crumbs. Cook under the broiler until a nice, golden-brown crust forms over the top – then serve, hot, with garlic toast.